Hypertrophic cardiomyopathy (HCM) is the inward thickening of the heart muscle which reduces chamber volume. The reduction of chamber volume reduces the volume of blood that can be pumped through the heart with each contraction. This causes health issues and eventually, death. There is no cure for HCM. 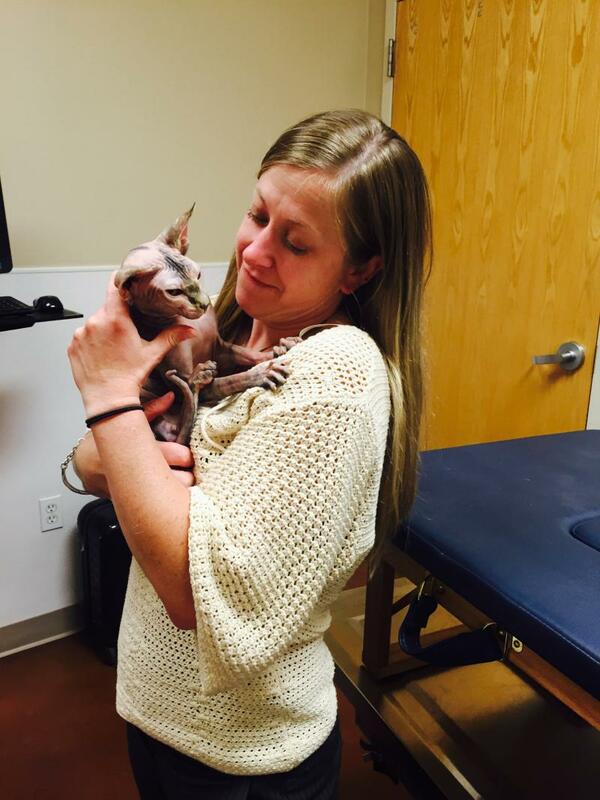 Many purebred cats have higher incidents of HCM including Sphynx. This is why our breeding cat's hearts are screened once a year using an echocardiogram completed by a board certified cardiologist. Unfortunately, even with the yearly screenings, HCM can still affect any cat at any age at any time. Always purchase your kitten from a reputable breeder with annual HCM scanning in place for every breeding cat. Phoebe with Dr. Dawn Webber after her echocardiogram on 6/26/2015.